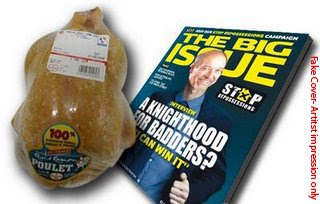 Bit of a contretemps with a Big Issue seller outside Marks & Spencer this morning. Now don’t get me wrong, I have total sympathy for these people, but that’s no excuse for poor grammar. “Big Shoe,” she repeated, waving a copy in my face. “It isn’t!” hissed my wife. I took the magazine from the vendor and pointed to the masthead. “Are you going to buy that one then?” she asked, holding out her hand expectantly. I was irritated to hear my wife snort behind me. Deciding that there was little point in continuing the conversation I harrumphed and began walking away. “Stop thief!” yelled the vendor. I thought she had gone mad until I realised I was still holding the magazine. I stopped abruptly, spun round and held it out apologetically. The vendor was right behind me and ended up receiving the magazine forcefully against her chest. At this point my wife hurried over, extracting a £5 note from her purse. The vendor was drawing back her leg and taking aim. When we pulled into the driveway I was still nursing bruised shins. My wife headed for the door laden with a couple of bags while I chased a frozen chicken around the car boot. I had finally grabbed it when a voice “halloed” behind me. I jumped banging my head on the boot lid. Turning around I saw Smith heading for his front door carrying a toolbox. “Is it? Is it a good morning?” I advanced towards him. “What’s that you have there? I sincerely hope it’s not part of another outlandish home-ed project. The children will be unable to find Scooby-Doo inside the television if they unscrew the back of it,” I laughed at my own little joke, but Smith regarded me stonily. No sense of humour these home-edders! “They are building a robot,” he replied. Smith nodded, but there was a scowl on his face I couldn’t fathom. He turned to go inside. Smith paused, staring at the front of his house for a moment before spinning back to me. He marched a couple of steps closer, put the toolbox down and folded his arms. “I need to see them in the teaching environment so that I can determine if it’s suitable,” I said, waving the frozen chicken at his front door. “Because you know deep down I’m right!” I smiled triumphantly. I started heading for the gate. “You're a former school inspector, so you should know..."
He watched me through half-lidded eyes. “Tomorrow afternoon. 1.50pm,” I declared. Without another word, Smith picked up the toolbox and headed back to his front door. I hefted the frozen chicken delightedly as I headed for my own house. I was already formulating a list of questions for the children. it's the little details that are so great - love the photo shopping on the big shoe. Thankyou so much for the laugh at the end of my day. 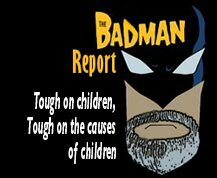 I have spent all week very active in trying to refute this Badman report and I have felt like giving up as it appears no-one in government is listening anyway.I had tears this morning of rage, frustration and anxiety and this evening tears of laughter. I do hope Badders will not be questioning my mental state. I think you should turn this blog into a book. Maybe ask for a grant from the LA with al the money that is going to be available from the DCSF for home educators ;>)What is your day job ? Oh dear oh dear. Is the real Mr Badman such a delicate little flower that he needs the other bullies in the playground at the DCSF to issue court orders to withhold FOI requests, manipulate google search results and threaten satirists? I hope he told his mummy as well, about all the horrible home educators who are upsetting him just because he called them all child abusers who needed their children examined by experts like himself? Perhaps Mummy can pick up the toys that have been thrown out of the cot? Aww poor Badders ........ Is he so terribly upset by all those NASTY home eddors poking fun at him? I don't suppose he can help it, after all he isn't an EXPERT in everything and needs to call in the expert bullies from the DCSF to block lawful FOI requests and threaten bloggers. Do you think we could launch a cease and desist notice on any crap coming out of the DCSF? FAKE Badman? what do you mean he's suddenly fake? I thought everything Mr Badman did was above board and full of integrity -especially his independent reviews? The man is genuine NOT fake- even the Church of England will not impeach his impeccable record. You do realise that calling Mr Badman a fake is libelous and slanderous and that you may be getting a visit from The Fixated Threat Assessment Centre (FTAC) which was , and I quote from the House of commons, established in order to better protect the public and vulnerable individuals in response to evidence that a significant proportion of people who engage in bizarre communications or contact with prominent people in public life are severely and acutely mentally ill and urgently need professional help. A small but significant number of such individuals can pose a risk to the public, the prominent person, and themselves, particularly in environments where there are armed police officers. The Home Office, the Department of Health and the Metropolitan Police Service agreed to establish a joint police/mental health unit, on a pilot basis, to assess and manage the risk posed by such individuals. Where appropriate, FTAC will introduce (or reintroduce) the individuals into existing community mental health care through established pathways. If offences are disclosed, and the circumstances warrant such intervention, consideration will also be given to a criminal investigation. I wish to protest on behalf of the guinea pig, the saucepan and the slippers. They are feeling vilified and harrassed. Please add a note to their photos to point out that they are fakes and merely the impression of an 'artist'. If you do not do so, I will have to take them into care. I thought the guinea pig was dead. Are you chanelling? Perhaps you might consider working as a medium once the totalitarian state has been dismantled and Blog Inspectors like yourselves need to seek new employment.